It was a casual tweet from a Tesla owner that got a response from none other than CEO Elon Musk himself. But it piqued the interest of animal lovers Internet-wide. Drivers of these high-tech vehicles already enjoy a feature that prevents the interior from exceeding a certain temperature and according to TechRadar, Musk says that a future update may include a ‘Dog Mode’, which would display a message warning passers-by not to panic if they see a pet inside a parked vehicle. 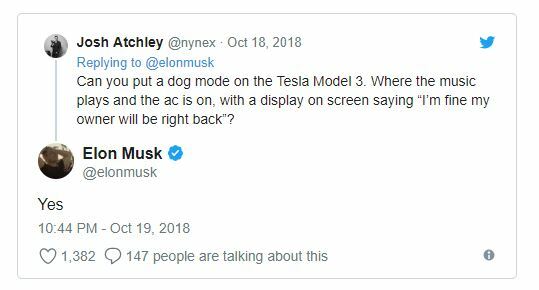 After the above tweet started a conversation on social media, Musk confirmed that such a feature could indeed be implemented, with a sign on the rear window letting the public known the dog’s owner would be back very soon. He also agreed that such a mode could include a display of the current interior temperature so well-meaning strangers don’t break the car’s window to rescue your pup. The pre-existing temperature-regulation feature, called Cabin Overheat, was pushed out to Tesla vehicles via a software update earlier this year. While in park, Cabin Overheat ensures that the temperature inside the car doesn’t exceed a preset limit. However, despite Musk’s positive response, this feature was created for safety, not convenience – so your animal will be safe if you leave it in the back seat for a few minutes. It is not for keeping them comfortable over long periods. 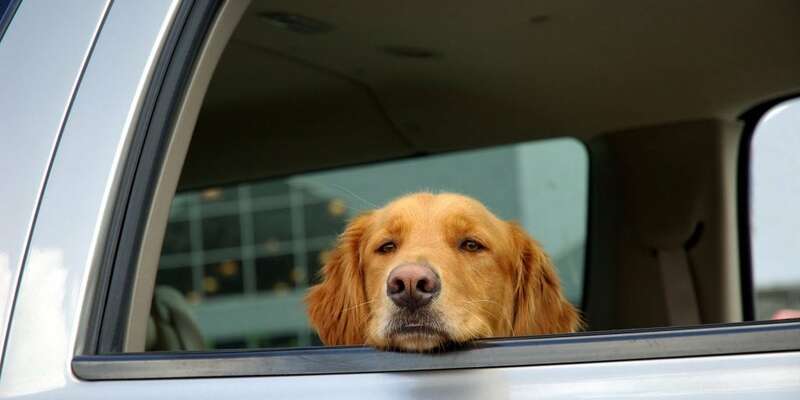 The American Society for the Prevention of Cruelty to Animals (ASPCA) advises never leaving a dog alone in a parked car, and notes that doing so is illegal in several states. According to the National Weather Service, the inside of a vehicle can reach 109 degrees Fahrenheit in just 20 minutes when the temperature outside is 80 degrees Fahrenheit! And every summer, reports of dogs (and even children) injured or worse by people who leave them in hot cars for even a short period of time go up. We think this “dog mode” idea isn’t half bad. How about you? some dogs have died when the owners left the a/c on and went into a restaurant or store. The a/c shut off while they were in the store or restaurant. A far better Tesla feature than Cabin Overheat which keeps the temp under 105 ,is what many call “camping mode.” You actually set a custom temperature, and the car maintains that temperature while you are gone. I put signs n each front window saying “AC is on. Dog is safe.” And, I use the Tesla phone app to check every once in awhile that it is working properly and keeping the car at 70 degrees. I don’t think enabling dog mode is a bad idea. I think it would help keep dogs safe while they’re in the car alone. I’m terrified to leave my dog in the car alone, but when I do it’s in the summer, and I leave the windows cracked. I’m only gone no longer than 3 minutes for a quick store run. I think this feature will let owners know it’s OK to take their dogs for a quick ride while keeping them safe at the same time. yes, yes and yes! 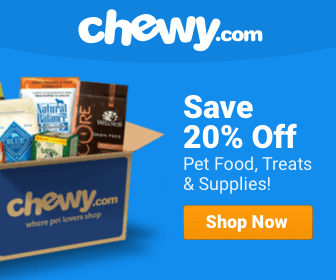 anything to keep our furry friends safe!! i would also have an alarm that would alert you should the ac malfunction! How about making it ILLEGAL with up to 1 year in jail with a $5000 dollar fine if you leave a dog in your car alone. Even if you leave the dog alone for three minutes for a short run. I say this because you never know what “might” happen while you are gone for only three minutes. You might slip and fall in the store and break your leg. Who knows? I personally NEVER leave any of my dogs in the car alone even if only for three minutes. You just never know and I would rather be safe than sorry. Yes, I understand by taking my dogs in my car with me, I could have an accident which could hurt them. If that happens, at least I would be there with them. I think the temperature-regulation mode is a good thing, and you can notify passers-by that you have it, but don’t tell people what to make of it. 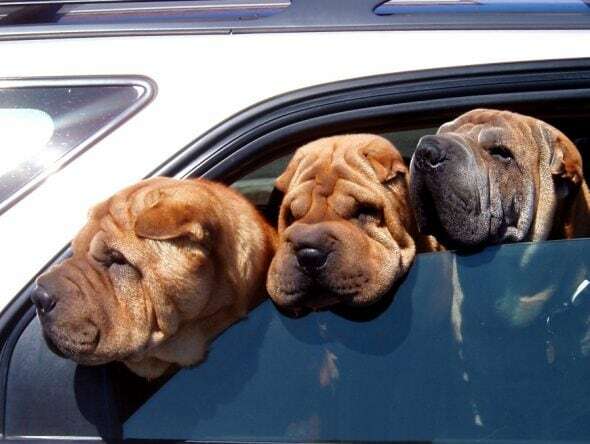 I’ve gone looking for owners of dogs I’ve seen looming uncomfortable in cars, only to find them having their hair done or doing loads of laundry. Overheating is tragic, but so is theft of your dog or making an anxious dog wait for hours until you return.